But the children were still quite young when their mother was laid to rest on a great flaming ship sent out to sea, as was befitting such a queen. She had been as beautiful and strong as the children she bore, and when she died the King had no eye for a woman for many years. In the end, it was his own children who persuaded him to search for someone to fill his loneliness. He left half-heartedly, but returned with a renewed glow in his eyes and a beautiful wife. Although still very young, she was already a widow left frail from the disease that had killed her first husband. It was not hard for the new wife to take the children into her heart as if they were her own. She loved the king dearly and his children were an extension of that love. But there was always a distance between them, because the children saw no strength or bravery in the new queen. Even with their differences, the family might have found contentment if a great force had not gathered to attack Lochlann. The Lochlannach, each and every one, prepared for the upcoming fight. The fragile queen was the only one unfit for battle, and the king was uncertain how best to protect her. At last he decided to send her to a remote cave in the cliffs high above the sea. He trusted only his own children to act as her guards. The children did know all the love and happiness the new queen had given to their father, and for this they cared for her, but they cried out and rebelled against being left out of the clash. Surely the Lachlannach could defeat anyone before they came so far as such a remote cave. The queen also fought the plan. If the invaders were able to cross to her, it would mean her husband must be dead. How could he let her live a second time as a widow? She called attention to the fact that her life in the hands of the enemy might be far worse than death. But her husband would not be swayed from his plans. He did not have the heart to lose another wife. When she saw her persuasions had failed, the queen contrived a plan of her own. The Lochlannach did not understand that courage is not only found in battle. One day, as she walked among a group of rocks exposed at low tide, she spotted one of the Finnfolk who are powerful magicians and shape shifters. This Finn looked young, which might have deceived her. Even a young Finn has been around a long time by human standards. They are not immortals, but because they make their homes in the Otherworld, they do not age at an Earthly speed. This Finn had assumed the shape of a man, with his head and torso in human form, but his lower half he had shaped into a thin pointed boat. Not many humans would call out to a Finn, especially a woman alone, for the Finn men are known as powerful seducers. The queen called out to him because she also knew they were gifted in sorcery. If the queen could learn his secrets, she might contribute to her new family even if she was physically weak. And so she called out to him until he turned to her. Once he saw her, he was beside her before she could blink an eye. The Finn are powerful oarsmen. The queen pulled three silver pieces from a purse she carried at her hip and held them out for the Finn to see. Finn folk have a great weakness for silver and can’t resist it. “Three silver coins for three magical secrets,” she said. The Finn had a dilemma. What did he wish for more, the beautiful human or her silver? The queen kept her hand out and made her bid again. Three silver coins for three magical secrets. The Finn stroked at his chin. The queen nodded her head. The Finn folk are mind readers. They understand thoughts better than emotions. He searched for the queen’s weakness in the hope that he might attain both her and the coins. But the queen was not swayed. Too fast for human eyes, the Finn snatched the silver from the queen’s hand and took hold of her face. He blew a magic breath into her as they plunged into the sea. They dove deep into the black water far from the sun and the air. The queen thought she was stolen for sure and would never see the surface again. But the Finn kept to the queen’s bargain. He took her to a place where she might learn from him for more than a year, while in her own world only minutes had passed. When the queen reappeared on the shore, she was, by mere human standards, a powerful sorceress in her own right. She returned with eyes that radiated bright understanding of our true world. The king, too smitten with her, was blind to the change. His children noticed, and they shivered whenever they were near her. They tried to warn their father that their stepmother was different, but he would not listen. The day came for the queen to hide in the remote cave with her stepchildren as her defenders. Before she left, she put a spell over the king that would make him untouchable in battle. She told him it was just a small prayer she had brought with her from her own land, but it was really something much more powerful. She left with confidence that she would see her husband again. From the far-away cave, children and stepmother waited out the uncomfortable silence. For three days they watched their army as it camped unmolested below them. It was daybreak on the fourth day when the attackers swarmed, but it was not the camp they sought. The enemy had arrived on the other side of the rock, hidden from the view of the Lochlann army. They had not come to do battle with the people of Lochlann; they had come for the king’s children. The Lochlannoch children formed a circle around the queen. Soon she was surrounded by the cries of battle, the crash of metal, the smell of blood and sweat and fear. She formed her own circle of enchantment around her family and held it as long as her mind would allow. The children fought well. The floor of the cave could not be seen beneath the bodies of fallen warriors, yet more lined up to meet the children in combat. The queen felt the strength of her magic begin to fade, and though they were not injured, the children were spent from the fight. She raised her arms and, in front of all who were present, she began to chant a powerful spell. The winds swirled and the waves smashed against the rock. The warriors dropped their swords to their sides, and the fighting stopped as they watched her. After a time, the seas became calm and stretched smooth as the best woven fabric. The queen opened her eyes and looked to her stepchildren. The children knew they could fight no longer. They clambered down the rocks with their approaching captors at their heels. As soon as the feet of the children hit the sea, they cried out in pain, but they did not stop. 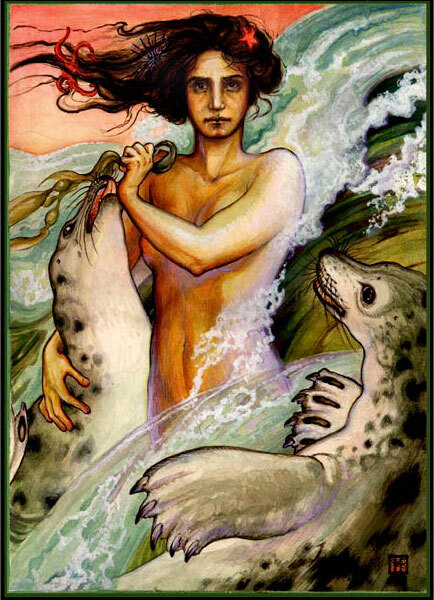 By the time they were neck deep in the waves, their human forms were gone and in their place the heads of seals bobbed up and down in the waves. Some of the enemy did attempt to catch them, but each one who tried was pulled under by the powerful current. Many were more prudent. They did not give chase as the children ran to the sea. Instead, they turned their swords on the queen. In her haste she had protected everyone in her family but herself. She knew she could not defend herself and return the children to their human form at the same time. Even if she did turn them human again, who would protect them until their father’s army arrived? She turned with uncertainty out toward the sea. An enemy near the queen saw the indecision cross her face. He made his move, plunging a knife deep into her chest while her guard was down. The air grew hot and still. No birds called from the sky. No waves crashed against the rocks. Every human breath suspended. Something…or rather someone…emerged above the taut surface of the ocean. He appeared without causing so much as one ripple on the water around him, and his presence seemed tied to the stagnant suppression of life that had settled upon the world. The face that stared up at the group on the cliff was inhumanly emotionless, but when his sharp eyes fell on the limp body of the queen, the sea began to churn and froth around him, clouds gathered in the sky and great gray waves rose toward the opening high above in the cave. The terrified warriors ran as fast as they could from their destruction, for they knew that it was unlucky to cross the sea folk. They hoisted their sails and sped away, only to face storms the likes of which have not been seen before or since. The abandoned body of the poor queen dangled over a rock high above the wild sea. A drop of blood rolled from her chest down the smooth curve of her arm, over her hand, along her finger until it hovered for a moment like a teardrop from the tip of her nail. It fell reluctantly into the water. One spot of red suspended in a wild gray sea. One spot of red, a combination of the queen’s own life force and the force of the magic she had created, merged with the rage of a Finn. The unspoken spell to bring the children back to human form was forever altered by the sea. 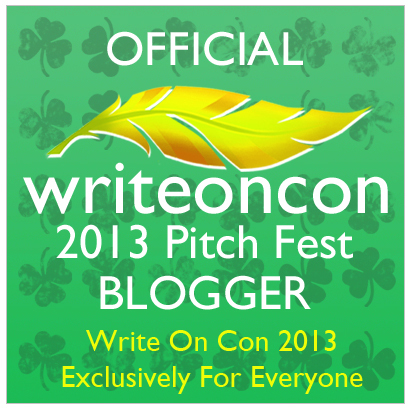 A few weeks ago, I signed up with WriteOnCon to work on the pitch for my young adult novel. It’s got me musing…what is the perfect pitch? Perfect pitch. I am not a musician, so maybe I am about to make a statement that is too simplistic. I believe in music, perfect pitch is the ability to hear a note and name it, or sing a note without hearing it first. In other words, perfect pitch is the ability to pull a sound from the cacophony of noise and define it. As I learn about the process of pitching a novel, I see it no differently in novel writing than in music. The perfect pitch is one that pulls that one kernel of truth and order from all the noise so that an author can say this is what my story is. Go ahead and love it as much as I do. One sentence to define the truth of a 525 page book. To stick with musical themes, as I skimmed through the backs of books in an attempt to understand what sells me as a reader, I discovered it is that moment of dissonance. The promise that careful order is about to fall apart. The characters I am about to meet are going to rub up against their world, sparks will fly, and from the ashes the author will unveil a glorious note. I am sold by pitches where the characters move quickly out of their stereotyped roles, where their world is about to become dangerous, out of order, uncomfortable. Where stereotyped plots, such as forbidden love, not only raise the stakes but are used to guide us to that kernel of truth, that glorious note. These are characters I know. I’ve meet their type before. Rich boy with everything in the world going for him. 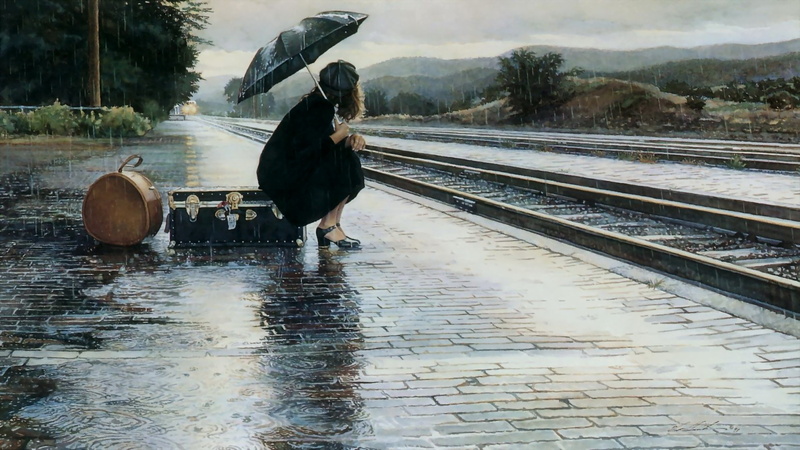 Poor girl from the wrong side of the tracks but with big dreams. What sets them apart isn’t that their families don’t approve, it’s the promise that they will never fully shed the lives they left behind. That is the kernel of truth, the perfect pitch, the solitary note that Maeve Binchy has pulled from the noise of ill-fated love stories. If I hadn’t seen that on the back of the book, I never would have opened it up to read it. I wouldn’t have known where it might take me. To my mind, this pitch has all the plot points without the kernel of truth. I’ve seen my fair share of after school specials that cover that theme, and I’ve already read every Sweet Valley High. What makes Sandra and Bobby’s story different from all the others? What do Sandra and Bobby learn from one another? How do they grow in a way that makes them unique? It would be no different if I were to walk up to Sandra and ask, “Who are you?” and she answered, “Oh, I’m head cheerleader and front man for the “It” crowd.” I know a million of such Sandras. But if she said, “I’m Sandra. I really want to love deep and hard and real. I’m willing to sacrifice everything I have for love, and if in the end I find myself alone, well, at least I tried, right?” Now I might stop to listen because Sandra has flaws and strengths and room to grow. Like music, a perfect pitch takes time, training and craft, but when it’s right you can feel it in your bones. As always, I’m so glad I signed up for WriteOnCon to work on my pitch with other authors. To me, the most perfect pitch is one I don’t have to write alone. The ability to find kindred spirits and work on craft with others is an invaluable tool. Writing might be solitary, but writing is meant to be read. It can’t be read tucked away in a file on your desktop. So get out and share. Good luck to everyone entering the WritOnCon Pitch Fest! If you haven’t thought of it yet, click here to learn more.